Dennis, who grew up Amish Mennonite, has a close relationship to the Amish in PA. In fact, the 2 Amish farms that we get the majority of our PA products from were friends and neighbors when Dennis was growing up. We have a long standing relationship with these farmers and visit them, when we can, while in PA. They are both big supporters of the Weston A. Price Foundation, www.westonaprice.org, and therefore try to produce the most nutrient dense foods, on 100% grass. We are very pleased to be able to support them. When you buy our cheese, butter, beets and a few other products, you are supporting them as well. In 2004 we embarked on a new direction in our lives. We quit some less than healthy habits and began the journey of searching out and eating traditional foods. One of the additions to our diet was sauerkraut. We bought it through a local farmer and began eating a bite or two every day. Why? Because we learned about the incredible health benefits of sauerkraut. Eating lacto-fermented foods every day strengthens the immune system and improves digestion. 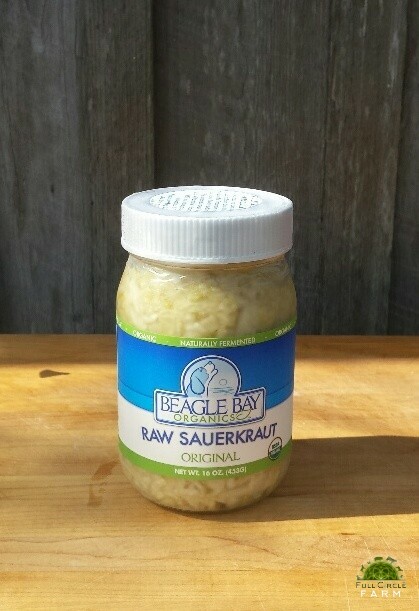 Within a few weeks, we realized that kraut had become a part of our every day life. Eventually, we decided to try our hand at making our own kraut the old fashioned way. We bought a ceramic crock, cabbage, and sea salt and we were off and running (the Beagles are an optional part of the process - they just love the kraut!) And what we discovered was that we were really good at it! Soon, our farmer asked to buy our kraut to sell to his customers so we started making bigger batches. Next we experimented with different flavors. Eventually, we moved into a commercial kitchen and the Beagles stayed home. But our roots in small homemade batches still continue to inspire us to make the tastiest and healthiest kraut possible. In 2017, I began working with a friend who had been fermenting foods for several years. He taught me the ins and outs of the fermentation process and the health benefits of prebiotics, probiotics and raw organic apple cider vinegar with the mother. One night, while working together and brainstorming, the idea for bringing back an age-old method for preservation of fruit was born. This method creates what is known as a shrub or sipping vinegar. 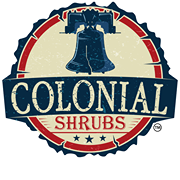 At Colonial Shrubs, we use all organic ingredients - we also use wild harvested fruits and vegetables when available. Because we make our Shrubs and Swiggs in small batches, flavors may vary slightly from one batch to the next. All of our products contain raw organic apple cider vinegar with the mother. Shrub syrup concentrates can be used for soda alternatives, marinades, salad dressings, flavorings for water or tea, cocktail mixers and vast other recipes. Embracing the inconsistencies in life with unique limited edition creations of lacto fermented vegetables and condiments using lacto fermentation. Because we try to use local and seasonal produce, natural variations occur due to the nature of the vegetables at a given time of year. Always organic. “Ferments” or “Cultures”: are locally produced using organic ingredients, locally sourced and grown when possible, filtered water and ‘real salt’ a high mineral salt, and wild grape leaves. Because of the variations in seasons and sources of vegetables no two batches are alike…limited editions! So, enjoy each version for its individual personality! Substitutions may be necessary depending upon availability. These products are a good source for a wide range of digestion friendly probiotcs and the fermentation process makes them nutritionally superior, even to raw! They can be used as an accompaniment to meals; 2 tablespoons a meal provides ample benefits and can also used as an ingredient in prepared foods such as hummus, salads and dressings, and are great as a component in sandwiches. When finished be sure to drink the juice in the jar as well! Good alone, it too can be taken as digestive before a meal, supplying the body with useful enzymes for digestion. Please return the jars if not needed. Kombucha: Locally handcrafted in small batches. Flavored carefully and thoughtfully with unique and healthful ingredients. Organic teas, organic evaporated cane sugar or raw honey and flavors are used. The kombucha is fermented in glass. Kombucha is a fermented tea using a fungus (sounds scary, it’s a perfectly safe one, also know as a scoby: a symbiotic culture of bacteria and yeasts) that converts the sugar and tannins into digestion and liver friendly beneficial acids & bacteria. It is reported to be a useful aid for detoxification. Please return the bottle to be sanitized and reused. Breads: all ingredients are organic, All breads use sprouted grains, that have been dehydrated and ground to coarse flour. * with the exception of the organic and freshly ground millet rice flour that is used, leavened with a sourdough starter, filtered water, water kefir and grains, high mineral salt. *may contain milk kefir as well. In 2009, we started to raise chickens for our own nutrient-dense foods. We met Dennis, and he encouraged us to sell our chickens and eggs as well as mentored us on pasture-raised poultry. This lead to our partnership with him to raise eggs, chickens, and turkeys when he was expanding his family and his dairy operation. We started with 300-400 chickens per year for meat and approximately 40-50 egg layers. At present, we are raising 700 chickens every Spring and every Fall as well as 50 turkeys each Fall, and 250 egg layers per year. Over the years, we have continually tried to improve our products by better land management, better feeds as they have come available, and improved packaging. We now sell NGMO chickens, turkeys, eggs, and broth. Our newest product is soy-free eggs. Shrink wrap is used on most of our chicken products to preserve freshness. Our mission is to provide you with the best nutrient-dense foods we can produce in accordance with the Weston A. Price diet guidelines, being as cost effective as possible. Hurricanes, lightning and beavers have taken down many trees on our Little River Organic acres over the past years so we started to turn out some very handsome and heavy stools and coffee tables. We cut thick live oak rounds and planks from sadly fallen trees and air dried them slowly in our barns. Then we turned sturdy legs of chestnut to support these weighty table tops to craft some awesome pieces, perfect deep grained chunks of the forest coated in durable hand rubbed satin urethane. 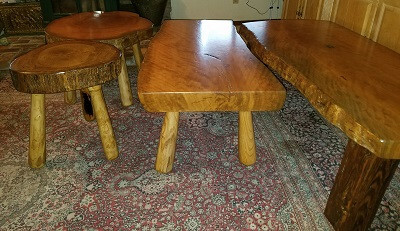 We have three basic styles; 3 legged milk stools at $325, four legged apprx 2 1/2' round coffee tables both with fascinating growth rings for $525, and apprx 5' long plank tables w beautiful grain for $725..all "live edge" to show that it was once a tree...weighing apprx 50, 80 and 150 lbs respectively...each strong enough to support your pick up truck or pet elephant...solid statements for home or office. maintain a healthy diet and lifestyle. Because we were so busy at work we either rarely had time to eat or when we did, that meal would get interrupted. The hardest thing was that we couldn't find a high quality, healthy, portable snack option that actually tasted great so we set out to change that and Rugged Meats was born! Our meat snack products are not only incredibly healthy but also taste amazing! Our sheep graze in our pesticide-free pastures all day. They are not given any growth hormones to increase milk production. Some of our milking ewes are given small quantities of non-gmo barley and alfalfa in addition to their grazing for extra nourishment. If you would prefer, we also have grain-free milk. If you are interested in purchasing delicious raw sheep milk, please let me know. fields in a state of homeostasis. Because heritage animals prefer a much wider variety of forages than commercial animals, there are very few weeds or brushes which grow out of control in our fields. Multi-species grazing the same area greatly minimize species-specific parasites as one species will ingest the parasites of another species thereby killing those parasites. By providing minimal human inputs, which would include allowing pastures to grow as nature intended and not mowed, animals graze on taller forages which are well above ground level where parasites thrive. The symbiosis between species is a wonderful sight. Chickens on the backs of sleeping cows nourishing themselves with flies and other pests, goats congregating with horned semi-feral cattle for predator protection, chickens and geese systematically cleaning manure deposits and ducks hunting the day away catching a plethora of insects after the four-legged animals create a disturbance with their gaits. The resting cows even provide entertainment for our goat kids by allowing them to play “king of the mountain” on their backs. We also strive for a semi-closed loop system whereby our ruminant animals (which thrive without additional supplemental feeding) provide food for our non-ruminant animals. Chickens eat goat whey left over from making chevre, ducks eat the buttermilk produced from making cow butter, pigs eat our excess eggs and so on. The sun and rain nurture the grass, the grass nurtures the ruminants, the ruminants nurture the non-ruminants and they all nurture the grass with their manure making our outside inputs minimal. We provide free choice naturally occurring minerals (the animals instinctually know which minerals are needed at what times in what amounts), dried kelp (natural source of multi-minerals which are easily assimilated in the body) and mineralized salt which all supplement what the soil does not naturally provide as well as intermittent herbs, garlic, pumpkin seeds, diatomaceous earth and apple cider vinegar to promote natural parasite resistance and a small amount of Non-GMO and Certified Pesticide/Herbicide free grains for the non-ruminants. The creatures on the farm include: Sebastapol Geese, Dutch Hookbill Ducks, Dominique Chickens, White Faced Black Spanish Chickens, Bronze Turkeys, Ancient White Park Cattle, Oberhasli Goats, American Guinea Hogs and Wiltshire Horned Sheep. While the farm is still in its growing stages, we hope one day soon to provide breeding stock so that others can promote these storied and stalwart animals and save their genetic importance from peril. We now have a new farm partner in the Tallahassee area. They do 100% grass-fed beef. 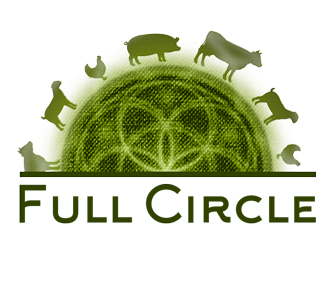 Like us this farm focuses on healing the land with regenerative practices, in the vein of Joel Salatin, using rotational grazing in a Silvopasture system. Silvopasture is the growing of trees widely spaced throughout a grazing pasture, which creates shade for cattle and a more diverse ecosystem of forage-types, birds and wild-life. Rotational grazing is the practice of moving cattle daily to fresh pasture, which provides a rest for grass-plant regrowth, spreads out fertility from manure and urine, and minimizes any cattle health issues by moving them off of yesterdays bathroom area, and onto today's salad-bar. Our own herd at Full Circle Farm is focused primarily on Dairy production, with only a few beef animals which are not enough for continuous supply of beef. That is why we seek out other top quality 100% grass-fed beef suppliers for your dinner table. This also provides you with an opportunity to get food from a different soil with a different soil nutrient profile. We believe it is good to eat foods from many different farms and locations, and to partner with other farms in our journey to heal the land.